Everyone loves the original Snuggie the blanket with sleeves! 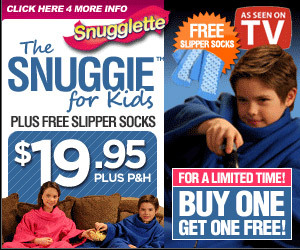 Now you can keep the whole family warm with Snugglette, a smaller size Snuggie with smaller arms so that kids can stay warm and do what they want to do! Snugglette is made with super soft, thick, luxurious fleece with roomy, oversized sleeves that let kids do what they want while still being totally wrapped in warmth.